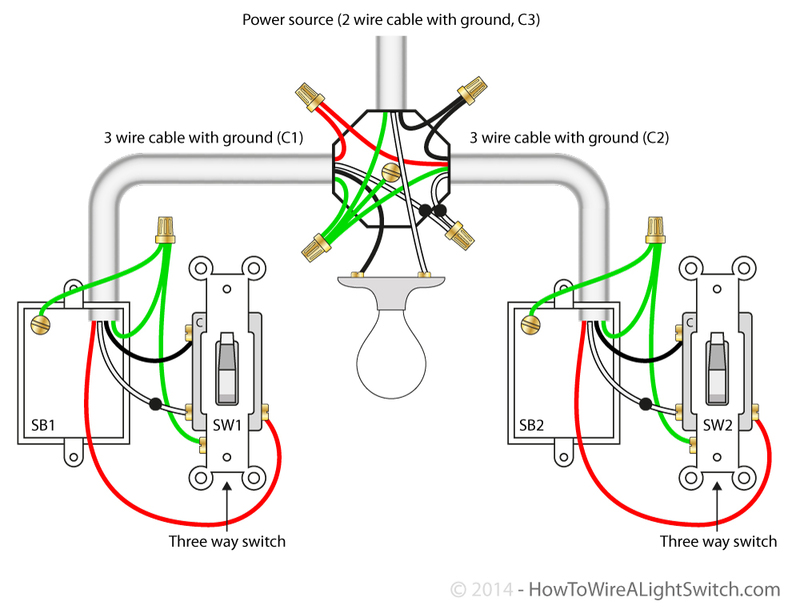 The power source in this circuit enters the light fixture where the neutral connects to the light and the hot is spliced through (via cable C2) to the common terminal of the 3-way switch (SW2). The travelers between the switches are also spliced together in the light fixture. The power to the light is via the common terminal of the 3-way switch SW1. 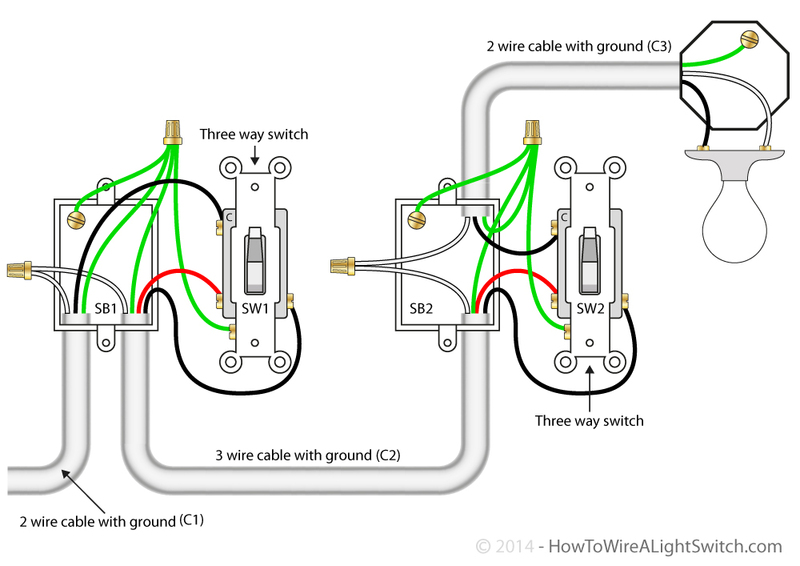 In this light switch wiring diagram the power feed joins the circuit via the light fixture where a two wire cable (C2) runs from the light, to the first 3-way switch (SW1), and a 3 wire cable (C3) joins the two switches. 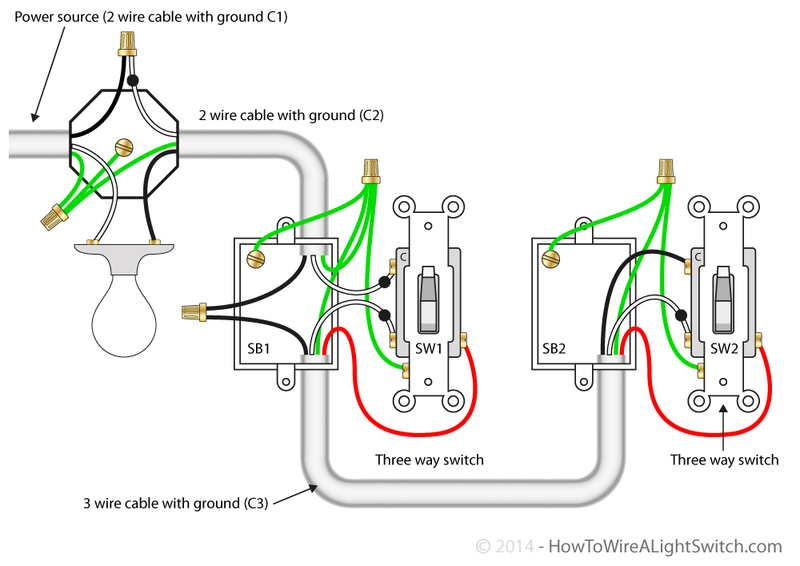 The hot source is spliced to the white wire (which should be marked as being hot with black tap) and run through to the common terminal of SW1, and from here the hot from the light is spliced through to the common terminal of the second 3-way switch (SW2). Here we have a single light controlled by 3 way switches. The hot from the power source connects to the common terminal of the first 3-way switch (SW1) and the neutral is spiced through (SB1) to the second 3-way switch (SW2) via the 3 wire cable (C2, that also carries the travelers that connect the two switches) where it is spliced through (SB2) to the neutral terminal of the light. The hot from the common terminal of the second 3-way switch (SW2) is connected to the hot terminal of the light.